A few weeks ago I was contacted by Action Aid to help spread the word on their Sponsor A Child Christmas campaign by cooking a recipe inspired by one of the countries they work in. 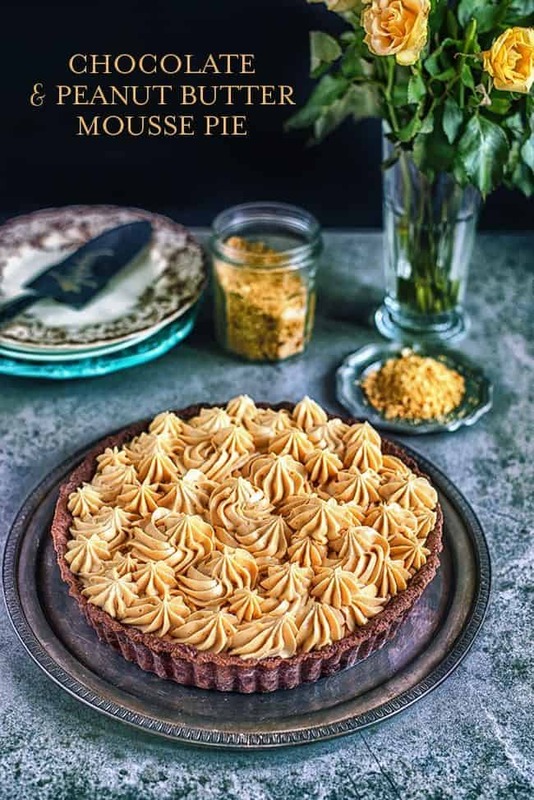 I started working on this peanut butter mousse pie (peanuts being one of the ingredients commonly used in Malawi) on Monday but then my four year old son got sick with a terrible cold. He had to stay home with me for three days – during which time he was very poorly but spoiled rotten. In a way, this only highlighted the need for charities like Action Aid – not all children have access to doctors, medicine, education or even enough food. Action Aid is urgently appealing for sponsors to help over 2,700 children in countries like Afghanistan, the Democratic of Congo and Myanmar who are suffering from the effects of conflict, hunger and lack of access to education and healthcare. For 50p a day, a UK sponsor can support a child (and their community) and in return receive letters and progress reports to see how the sponsorship transforms their lives. Click here more information on how to become a sponsor or perhaps gift a sponsorship this Christmas. There also several other ways to get involved and make a difference. What can I say about this? I wanted to make something chocolate + peanut buttery (check out the peanut butter millionaire’s shortbread) for a long time and it surpassed my expectations. It is rich, it is incredibly indulgent and I may (or may not) have had it for breakfast and lunch today. Notes: You will need whipped cream for both the chocolate and peanut butter mousse. Best whip the full quantity of cream (500ml / 2 cups) and store in the fridge until needed. • The chocolate mousse needs a little time to set in the fridge before you top with the peanut butter mousse. • You will have a little leftover mousse (both chocolate & peanut butter) – pour into glasses and serve with some caramel sauce! Put the flour, sugar, cocoa and salt in a large bowl and mix together with a fork. Make sure there are no lumps of sugar lurking in there. Add the cubed butter and rub everything between your fingers until it resembles breadcrumbs. Avoid overworking the dough or the butter will start melting. Add the egg and 1 tbsp cream and mix together to form a dough. If it’s too crumbly add a second tablespoon of cream. Form dough into a disk, wrap in cling film, and put in the fridge for a couple of hours or overnight. Preheat the oven to 180C (350F). Place a large, flat baking tray on the middle shelf. Dust your worktop and rolling pin with a little flour and roll the dough out to a thickness of about 6mm (1/2 inch). Drape over the rolling pin and carefully transfer to cover a 21cm (8in) loose bottomed tart tin. Gently fit to the tart tin but leave any excess dough hanging over the edges, folding over if too long. This prevents too much shrinkage and ensures trim edges. Chill for an hour. Place baking paper over the tin and fill with baking beans (or dried pulses – I used lentils). Bake for 12 minutes. Take out of the oven, remove the baking beans and paper and lightly score with a fork – without pushing all the way through to the bottom. Return to the oven and bake for a further 5 minutes. Trim the edges and cool completely before using or store in the fridge, still in the pan, covered with cling film for up to two days. Chop the chocolate into small pieces and put in a large bowl. Put two tbsp of hot water in a glass and sprinkle with the gelatine. Mix together thoroughly until gelatine dissolves. Heat the milk in a saucepan until small bubbles appear around the edges. Pour over the chocolate and leave for a couple of minutes. Add the gelatine water and then stir together with a whisk until the chocolate is completely melted and smooth. Gradually add the whipped cream, stirring with the whisk as you do, until smooth. Heat the crunchy peanut butter in the microwave in short bursts until warm enough to easily spread over the prepared tart. Pour the mousse over it (fill halfway up) and chill for 1-2 hours. Use a stand or hand mixer to whisk the cream cheese, icing sugar, vanilla and peanut butter until smooth. Add the gelatine water and whisk it in. Gradually add the whipped cream and gently stir it in with a hand whisk until smooth. Transfer the mousse to a piping bag fitted with a large star tip and pipe the mousse over the chocolate mousse. Chill for a minimum of 2 hours. Sprinkle with crushed peanuts and drizzle with a little caramel and serve. Wow wow wow! Sounds fantastic! I love the shot of the peanut butter mousse being poured in 🙂 …Blogger appreciation for that lovely capture! This looks incredible. I think it would be the perfect end to a dinner party or celebration. Amazing as ever! And what an important cause to raise vital knowledge and funds for. This pie looks beyond delicious Lucy.. seriously craving a slice right now! Oh man. Chocolate and peanut butter in a mousse pie?! I'm drooling! And that pouring shot is just stunning! Yum! This is gorgeous! I am loving the look of this pie! o Boy..this looks so rich and irresistible! That is one seriously decadent tart. Love the chocolate pastry. Love the combination of chocolate and peanut. Breakfast and lunch? Sounds and looks so delicious Lucy! Thanks Hannah – it was completely impossible to resist! I think that peanut butter mousse would be absolutely incredible as cake filling/frosting!